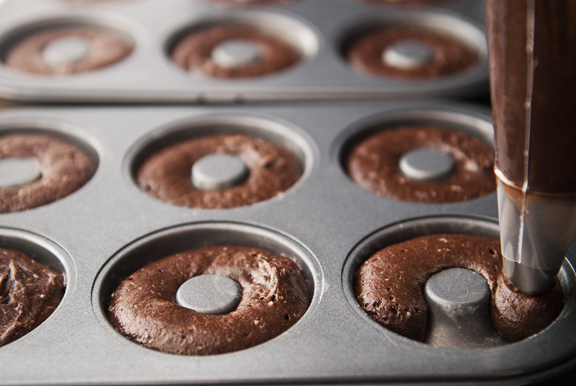 Doughnut pans are shallow, so try to avoid the temptation to overfill them as they will rise during baking and seal over the doughnut hole. Then you’ll have baked not doughnuts, but hollow muffins or oddly shaped low-capacity bowls depending on how you look at it. I found the right amount was 2/3 full or maybe 1/4-inch below the rim. 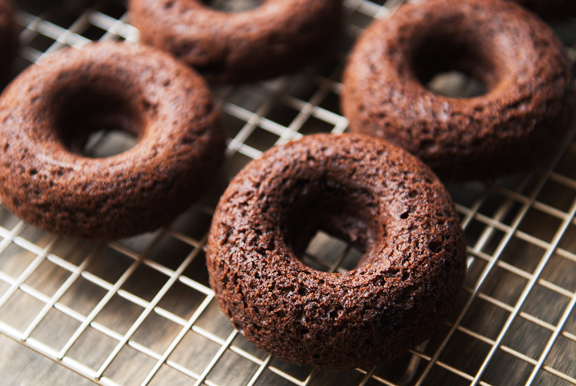 The bake time has a little leeway, but the doughnuts should be springy when you push on them. I flipped them out of the pan onto a cooling rack immediately, mostly because I needed the pans to cool so I could bake the rest of the batter. 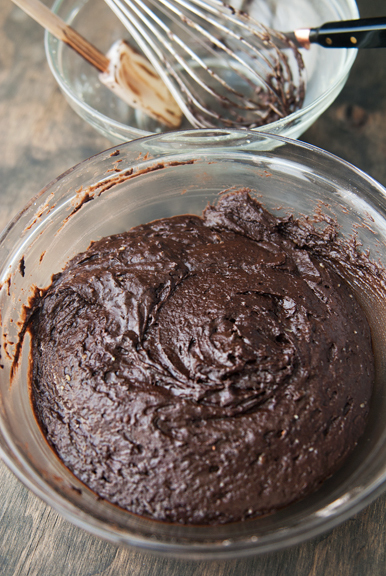 While the doughnuts cool, you can whip up the glaze. I personally prefer a plain sugar glaze on my chocolate doughnuts, but Jeremy is a fan of the chocolaty chocolate-filled chocolate doughnut with chocolate glaze, rolled in chocolate. Ridiculous. But I thought it would be worth testing out a chocolate glaze. The glaze takes minutes to make which is just about right because the doughnuts cool pretty quickly (toroidal shapes have less heat capacity than oblate spheroids). 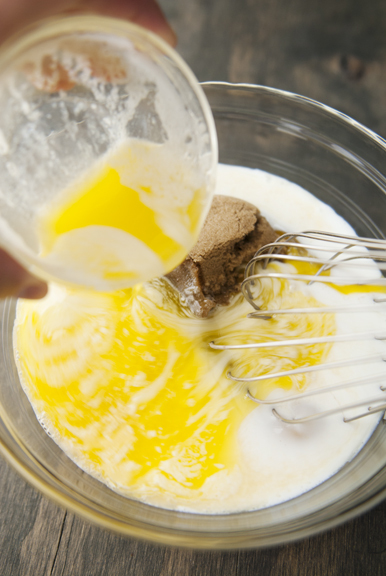 If the glaze develops a crust, just give it a good stir with the whisk to break it up until it is smooth. Dip the doughnuts halfway into the glaze, then set them right-side up on a cooling rack over a baking sheet to let the excess glaze drip off. Add sprinkles before the glaze sets or else the sprinkles will bounce off the glaze and roll under furniture. I found the best way to do this was to dip two or three doughnuts, then administer the sprinkles. Should you be so lucky as to have an assistant with opposable thumbs, you could just assembly line the process and dip while the assistant sprinkles. So, these doughnuts are not like the cake doughnuts one buys from the store or from doughnut shops. 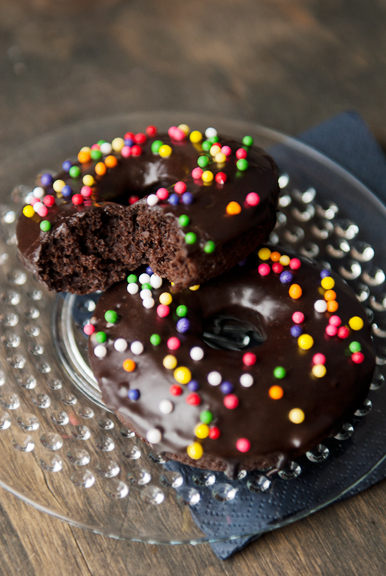 These are actually CAKE doughnuts, as in, they have the texture of a tender, moist cake. I’m not complaining, I think they’re delightful and a lot less brick-like than typical cake doughnuts. I may still try to hunt down that denser cake doughnut version, but based on the happy dance that Jeremy did after he ate two doughnuts in one sitting, this recipe is a keeper. AND there’s no pot of oil to clean up! 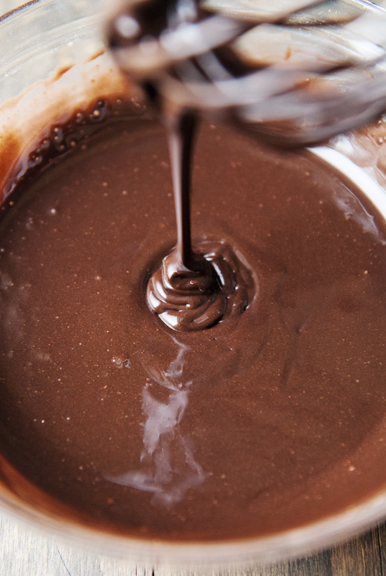 Make the doughnuts: Preheat oven to 325°F. Brush doughnut pans with melted butter. 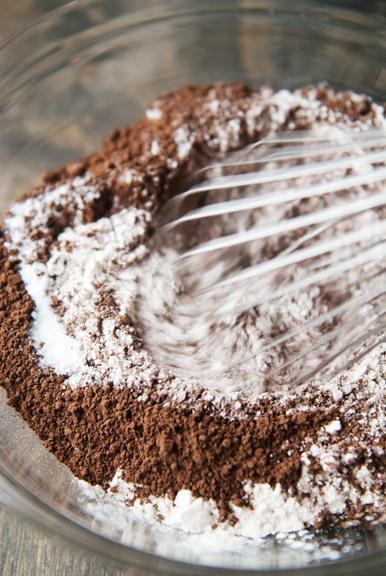 In a large bowl, whisk the flour, cocoa powder, baking soda, and salt together. 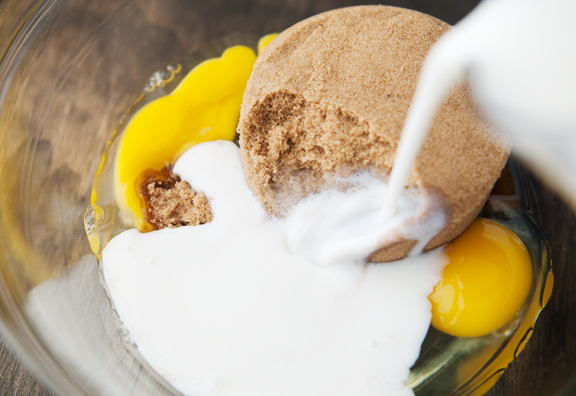 In a medium bowl, whisk the buttermilk, brown sugar, eggs, melted butter, and vanilla extract together until smooth. 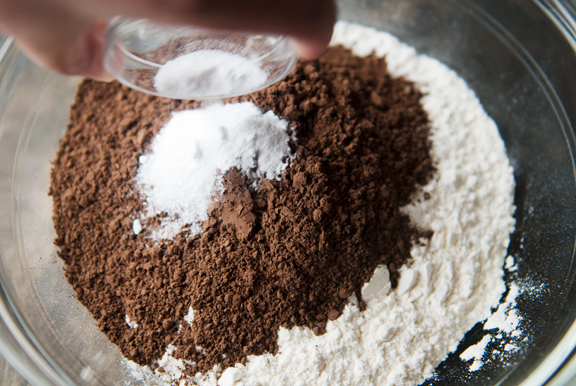 Pour the wet ingredients into the dry mix and combine until smooth. 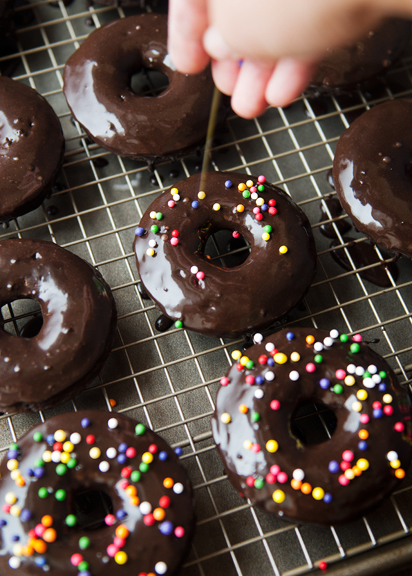 Fill a piping bag with the batter (or a ziploc bag – just cut the corner when you’re ready to fill the pan) and fill each doughnut ring no more than two-thirds full. Bake 13 minutes or until the top of a doughnut springs back when you press on it with your finger. Remove from oven and invert the doughnuts onto a cooling rack. 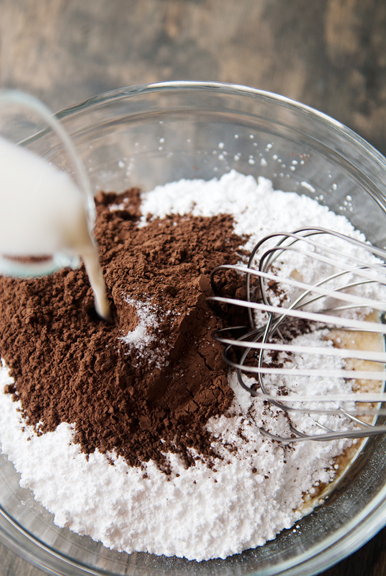 Make the chocolate glaze: Whisk the powdered sugar, cocoa powder, salt, milk, and vanilla extract together in a medium bowl until smooth. 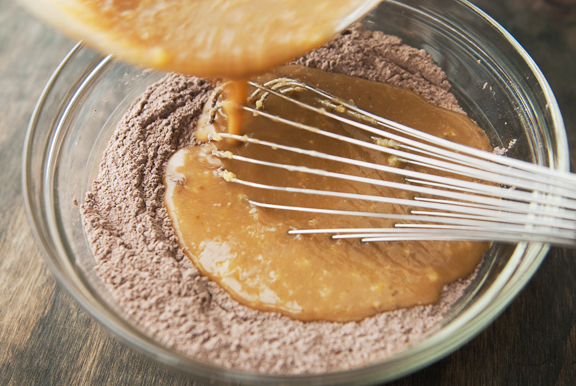 Don’t whisk too vigorously or you’ll wind up with a lot of air bubbles in your glaze. 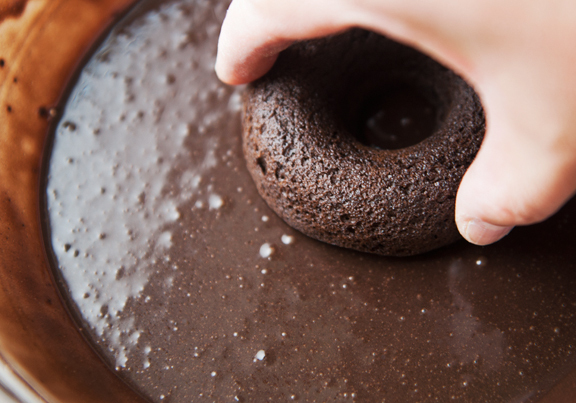 Dip the doughnuts, one at a time, into the glaze top-side down. Set the doughnuts top-side up on a cooling rack set over a baking sheet to let excess glaze drip off. 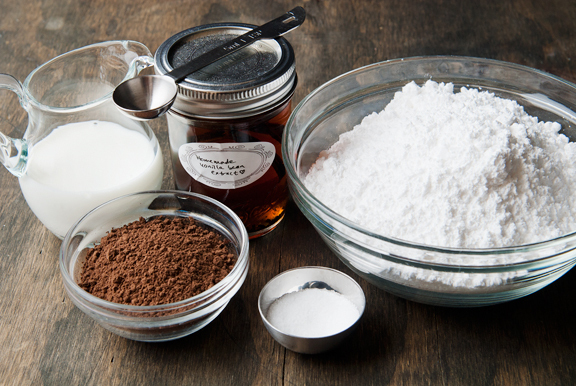 Administer any sprinkles or decorations while the glaze is still wet. Let the glaze set (about 30 minutes). Me and my husband are together for 20 years now and that is also half of my life but to be honest I hardly can remember that time before we met. Along the way we got one beautiful girl almost 7 years old and they are the most important persons for me. They are my whole world. In my country halloween is not celebrated but yesterday was another holiday for my family called Slava and for Slava we tradicionaly make a feast. Your doughnuts looks delicious and i will certainly make it for my family. These look beyond delicious, and I love your photographs. Those sprinkles are the best I’ve seen, I can never find ones like that! “oddly shaped low-capacity bowls” – hahahaha! Definitely going to try this, and also I totally understand finding the best half of your life. Which makes us pretty damn lucky. Happy anniversary! You are so, so very funny. I love your sense of humor. These doughnuts are beautiful, too. 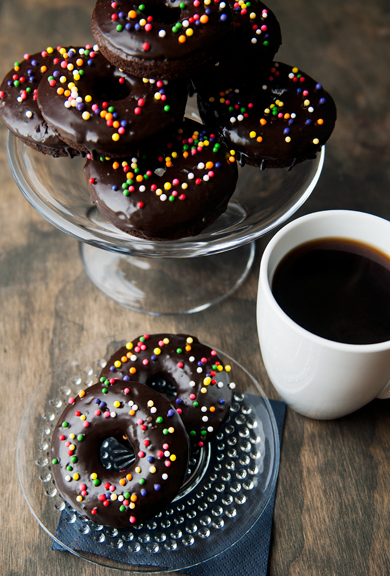 I am now inspired to purchase a doughnut pan, so I can make these for an upcoming family gathering. “toroidal shapes have less heat capacity than oblate spheroids” – love it! Everyone keeps posting about doughnut pans but I also struggle with the idea of yet another thing in the kitchen cupboard… I’ve only used the madeleine pans twice since purchasing. I like the particular kind of sprinkles you used, but I’m having trouble locating them on the interwebs. Could you please tell me what brand they are? You are a funny girl!! Please mail me one donut. Happy Anniversary! Woo-hoo, I too fought the urge to buy those pans until I saw them in a marked down bin at a coffee shop, of all places. I’ve made pumpkin and banana buttermilk “donuts” so far. Not bad, kids liked ’em. And I don’t feel quite so guilty for the unhealthy treat. ” Smoochiversary”, how sweet, you two seem like a perfect match. I, too, love to make the foods my “very best person I have ever known” loves to eat–which means I eat a lot more Mexican than I would otherwise. He is not too fond of doughnuts, but I’ll be making these for another “very best person I have ever known,” a.k.a., my daughter (and, yes, I know that grammatically, you can only have one “very best person,” but what does grammar know of the heart? Baked donuts are my fav… they are so moist and soft.. Looks delicious..
Ok a) the Olympic Peninsula is gorgeous… go Washington! b) these donuts look so unbelievably delicious and c) tour photography is stunning! Loving this. Beautiful doughnuts, lovely sentiments, great humor. I was in my hometown over Halloween and saw lots of Trick or Treaters as I drove back to my in-laws in the evening, even though it was raining. They live in the country & had about 8 kids. Back here at home, my family had a low turnout. I think Trick or Treating must be turning into a more regional thing….more popular in some areas. As usual, we never had any kids came for the holiday candy-handout. Happy Anniversary to you and Jeremy!! 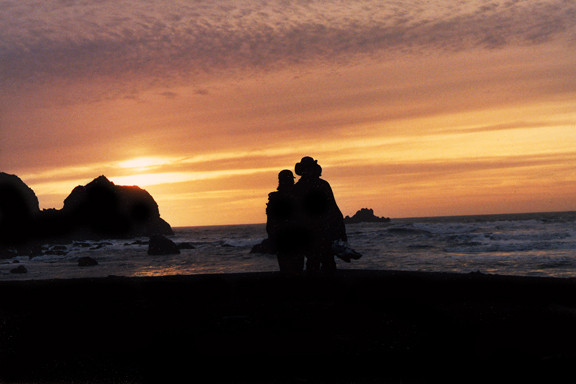 Have another 42 years of happy anniversaries, dear. So i should buy a donut pan? And should i buy a popsicle pan? No, i should buy a donut pan! I’ve been avoiding this! 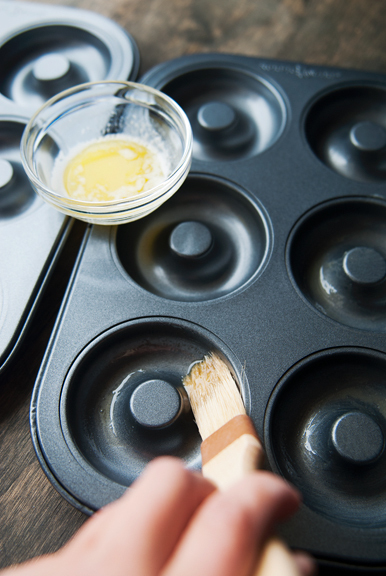 Katie – I think doughnut pans are worth it (for me) because it will probably prevent me from frying doughnuts! 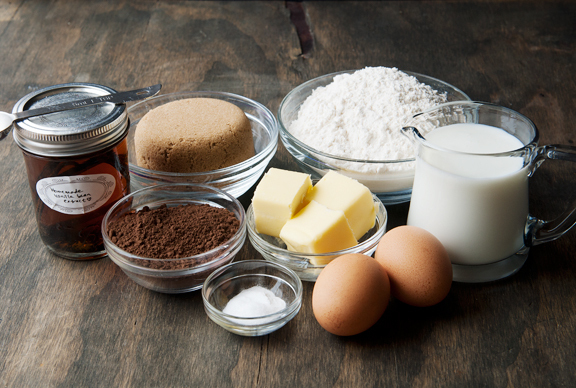 Judie – I think you can make these as muffins or cupcakes, just check for doneness with a toothpick and probably bake a little longer? We eat only organic, so I really appreciate your sharing what looks like a great recipe! I was wondering about the sprinkles, too. 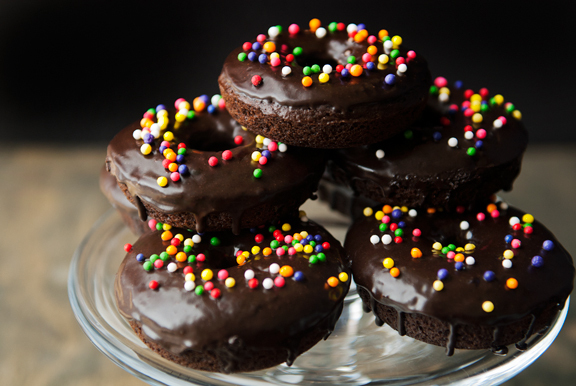 Anyone find non-GMO sprinkles out there that I can put on these donuts? Wow! Just made these and they’re perfect! Thank you!!! Ojive – You can try Target. I got mine from Target, but the one in Superior. You might also try Peppercorn although I suspect it will cost more. The downtown Boulder Target does indeed stock them-thanks for the tip off! Also, the recipe’s exactly as good as it looked-thanks for always posting such amazing stuff! I buy almost everything from Amazon…I joined Amazon Prime for about $80/year and everything I am looking for is part of that club with free shipping. You also get Amazon Instant Video (like Netflix) as well. A great deal! I bought my donut pans for less that $7/ea! These are absolutely amazing! I made them today and it was a nice, easy recipe.